100% of precincts reporting (24,847/24,847). Income taxes collected by the state of California mostly go into the state’s General Fund. Most of the money in the General Fund goes toward education and health care services. In 2012, voters approved a higher, temporary tax on California residents making more than $250,000 per year. Money from this tax provides about $7 billion for the state each year. The tax is scheduled to expire at the end of 2018. There was a temporary increase in the sales tax which expires at the end of 2016. The 2012 income tax increase would be extended until the end of 2030. People earning more than $250,000 and couples earning more than $500,000 per year would pay between 1 and 3 percent higher taxes on income over those amounts. The money collected from these taxes would provide more money for schools and community colleges. Prop 55 would also provide extra money to the Medi-Cal health care program in some years. The temporary increase in the sales tax would expire. 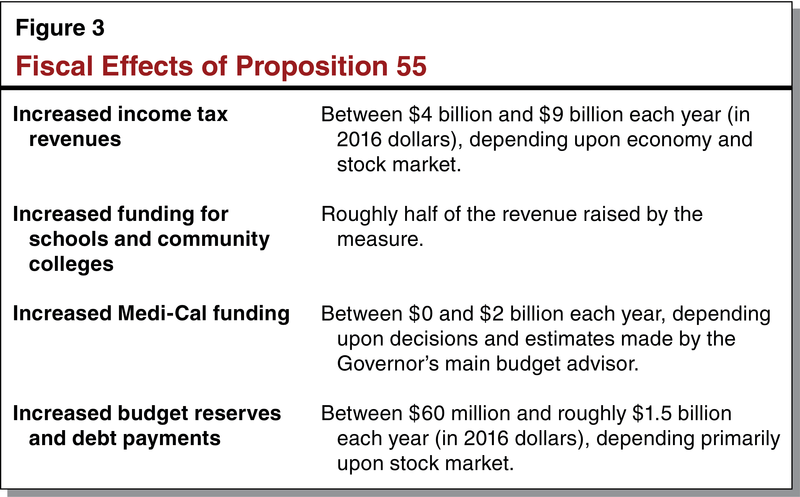 Prop 55 would raise between $4 billion and $9 billion in taxes each year for the state. Roughly half of this money will go toward schools and community colleges. Medi-Cal could receive up to $2 billion dollars extra annually, depending on the taxes collected and other factors. Prop 55 would provide billions of dollars for schools and community colleges. Prop 55 would only affect California residents who can afford to pay more in taxes. Voters should respect their decision from 2012. Current taxes should expire in 2018. Prop 55 will hurt small businesses and eliminate jobs. It will also take money away from people who have worked hard to earn it. Should the State Constitution be amended to extend certain income tax increases on high-income taxpayers through 2030, and increase funding for Medi-Cal benefits? This year’s state General Fund budget is about $122 billion with over half going to education and about one-quarter to health and human services, which includes the Medi-Cal program. Income taxes, imposed on payroll, investment income, and profits from the sales of stock or other assets, provide about two-thirds of General Fund revenues. Tax rates increase as a person’s taxable income increases. In 2011, tax rates ranged from 1% to 9.3%. Prop. 30 in 2012 increased these rates 1% to 3% through 2018 on high-income taxpayers, defined as individuals earning more than $263,000 a year and couples earning more than $563,000 a year, and a quarter-cent increase in the state sales tax. This year Prop.30 income tax increases will raise about $7 billion, all for K-12 schools and community colleges. The state must spend a minimum amount annually on K-12 schools and community colleges. This year, the General Fund will provide over $50 billion towards this minimum guarantee. Local property taxes also contribute to this obligation. The Medi-Cal program provides health care services to over 13 million low-income people—roughly one-third of the state’s population. It relies heavily on federal funding and receives some support from other state sources. The Prop. 30 income tax increase is set to expire at the end of 2018, and the sales tax increase to expire at the end of 2016. Prop. 55 would extend the Prop. 30 income tax increases on high income taxpayers from 2018 through 2030 (an additional 12 years). Income tax increases would vary by level of income. On a single person’s income of $300,000, there would be an additional tax of $370, while on a married couple’s income of $2,000,000, there would be an additional tax of $37,980. These additional revenues would continue to provide funds to K-12 and community colleges, but also be directed to the Medi-Cal program, based on a new formula for its funding. Prop. 55’s increased revenues would be used for education, health care services for low-income people, and other state budget purposes. The amount of additional state revenue is uncertain. Depending upon the economic year, the increases could range from $4 billion to $9 billion. Roughly half of any revenue increases would go to education. Additional Medi-Cal funding under Prop. 55 could vary significantly, possibly ranging up to a maximum of $2 billion per year. Prop. 55 could increase annual contributions to “rainy day” budget reserves and annual payments of state debts by $60 million to $1.5 billion or more. Prop. 55 maintains existing tax rates, so the wealthy pay their fair share to provide adequate funding for education and health care. Prop. 55 has strict accountability requirements, making sure that the funding reaches the schools. Voters who approved Prop. 30 were promised that the increases would be temporary, not permanent. Prop. 55 tax increases are not needed to adequately fund education, health care and state government, and would be a job-killer. Extends by twelve years the temporary personal income tax increases enacted in 2012 on earnings over $250,000 (for single filers; over $500,000 for joint filers; over $340,000 for heads of household). Allocates these tax revenues 89% to K–12 schools and 11% to California Community Colleges. Allocates up to $2 billion per year in certain years for healthcare programs. Bars use of education revenues for administrative costs, but provides local school boards discretion to decide, in open meetings and subject to annual audit, how revenues are to be spent. Increased state revenues ranging from $4 billion to $9 billion each year (in today’s dollars) from 2019 through 2030, depending on the economy and the stock market. Increased funding for schools and community colleges of roughly half of the revenue raised by the measure. Increased funding for health care for low-income people ranging from $0 to $2 billion each year, depending on decisions and estimates made by the Governor’s main budget advisor. Increased budget reserves and debt payments ranging from $60 million to roughly $1.5 billion each year (in today’s dollars), depending primarily on the stock market. Over Half of State Budget Spent on Education. The state collects taxes and fees from people and businesses and uses these revenues to fund programs in the state budget. This year, the state plans to spend about $122 billion from its main operating account, the General Fund. 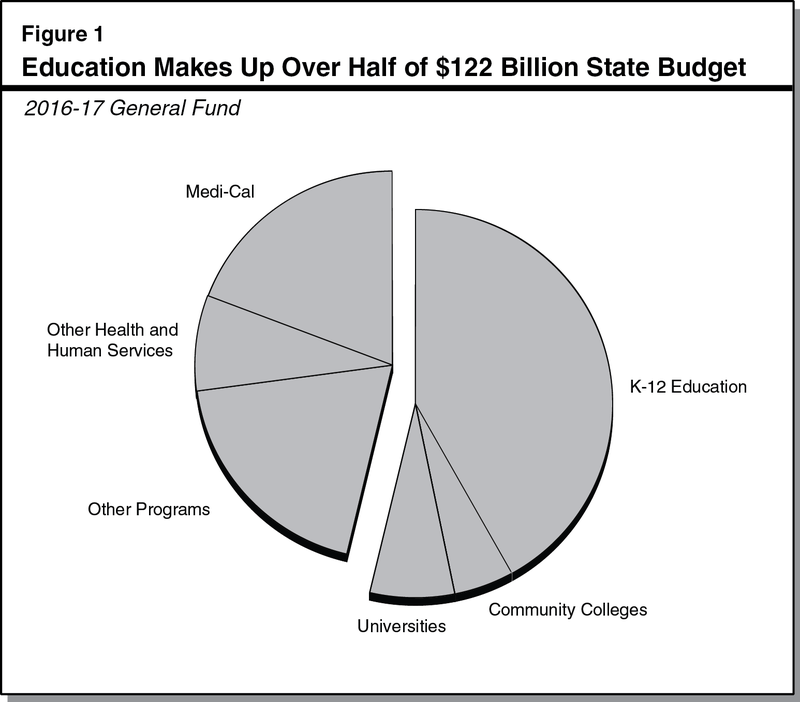 As shown in Figure 1, over half of this spending is for K-12 schools, community colleges, and the state’s public universities. About another one-quarter of this spending is for health and human services programs, the largest of which is the state’s Medi-Cal program. Most of the spending shown in the figure for “various other programs” pays for prisons, parole programs, and the courts. Personal Income Tax Provides Most General Fund Monies. The state’s General Fund is supported primarily by three taxes: the personal income tax, the sales tax, and the corporate income tax. (We refer to the personal income tax simply as “income tax” in this analysis.) The income tax is the most important for the state budget, as it provides about two-thirds of all General Fund revenues. The tax applies to most forms of income—such as salaries, wages, interest income, and profits from the sales of stocks and other assets. It consists of several “marginal” tax rates, which are higher as income subject to the tax, or “taxable income,” increases. For example, in 2011 the tax on a married couple’s taxable income was 1 percent on the first $14,632 but 9.3 percent on all taxable income over $96,058. Proposition 30. 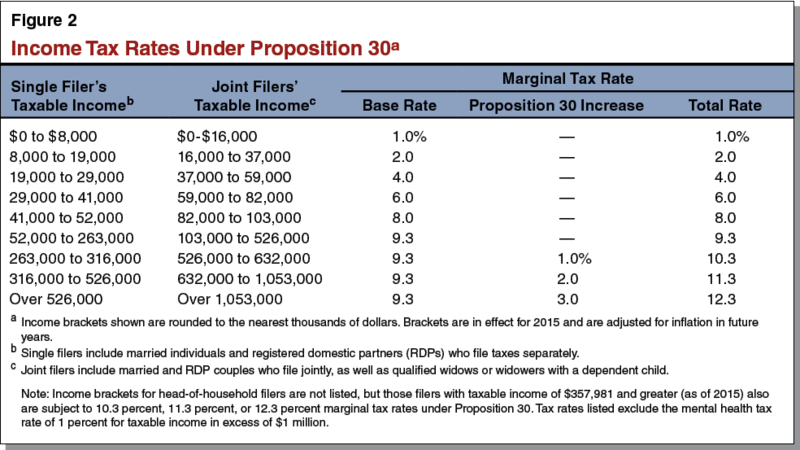 Proposition 30, approved by voters in November 2012, increased income tax rates on high-income taxpayers. As shown in Figure 2, depending on their income levels, high-income taxpayers pay an extra 1 percent, 2 percent, or 3 percent tax on part of their incomes. These higher rates are in effect through 2018. This year’s state budget assumes that the Proposition 30 income tax increases will raise about $7 billion in revenue. Proposition 30 also increased the state sales tax rate by one-quarter cent from 2013 through 2016. Annual Required Spending on Education. The State Constitution requires the state to spend a minimum amount on K-12 schools and community colleges each year. This “minimum guarantee” grows over time based on growth in state tax revenues, the economy, and student attendance. This year, the state General Fund will provide over $50 billion towards the minimum guarantee. Local property taxes also contribute to the minimum guarantee. Serves Low Income People in California. The Medi-Cal program provides health care services to low-income people. These services include primary care visits, emergency room visits, surgery, and prescription drugs. The program serves over 13 million people in California—roughly one-third of the population. This year, the state will spend about $23 billion from the General Fund on Medi-Cal. In addition, the program relies heavily on federal funding and receives some support from other state sources. “Rainy-Day” Reserves. Governments use budget reserves to save money when the economy is good. When the economy gets worse and revenues decline, governments use money that they saved to reduce the amount of spending cuts, tax increases, and other actions needed to balance their budgets. Constitution Requires Minimum Amount Used for Debt Payments and Budget Reserves. The Constitution requires the state to save a minimum amount each year in its rainy-day fund and spend a minimum amount each year to pay down state debts faster. The annual amounts used for debts and budget reserves depend primarily upon state tax revenues. In particular, revenues from capital gains—money people make when they sell stocks and other types of property—are an important factor in estimating how much the state must use for these purposes. This measure (1) extends for 12 years the additional income tax rates established by Proposition 30 and (2) creates a formula to provide additional funds to the Medi-Cal program from the 2018-19 state fiscal year through 2030-31. Income Taxes Increased on High-Income Taxpayers. Proposition 55 extends from 2019 through 2030 the Proposition 30 income tax rate increases shown earlier in Figure 2. These increases affect high-income taxpayers in the state. Specifically, the measure affects the roughly 1.5 percent of taxpayers with the highest incomes. Does Not Extend Sales Tax Increase. Proposition 55 does not extend the one-quarter cent increase in the sales tax rate that voters approved in Proposition 30. In other words, whether or not voters pass this measure, Proposition 30’s sales tax increase will expire at the end of 2016. Creates Formula for Medi-Cal. Proposition 55 includes a new state budget formula to provide more funding for the Medi-Cal program. The measure requires the Director of Finance, the Governor’s main budget advisor, to determine each year from 2018-19 through 2030-31 whether General Fund revenues exceed (1) constitutionally required education spending and (2) the costs of government programs that were in place as of January 1, 2016. If revenues exceed these spending amounts, 50 percent of the excess (up to a maximum of $2 billion) would be allocated to Medi-Cal. (This additional allocation could be reduced somewhat in difficult budget years.) The measure states that these Medi-Cal monies should not replace existing General Fund support for the program. Figure 3 summarizes Proposition 55’s fiscal effects. The measure’s increased revenues would be used for K-12 schools and community colleges, health care services for low-income people, budget reserves, and debt payments. After satisfying these constitutional requirements, remaining amounts, if any, would be available for any state budget purpose. Increases in Education Spending. Higher state tax revenues generally result in increased education spending. The exact amount that the state must spend on schools and community colleges in the future depends on several factors that are difficult to predict. It is reasonable to assume, however, that roughly half of the revenue raised by Proposition 55 would go to schools and community colleges. May Increase Medi-Cal Funding. The formula for added Medi-Cal funding would require the Director of Finance to estimate annually revenues and spending. As noted earlier, General Fund revenues are difficult to predict. Similarly, in order to produce the spending estimates required by the measure, the Director of Finance would have to make assumptions about how spending on programs that were in place as of January 1, 2016 would have changed over time. Additional Medi-Cal funding under the measure, therefore, would depend on decisions and estimates made by the Director of Finance. The amount of any additional Medi-Cal funding under the measure could vary significantly each year, ranging from $0 to $2 billion. Increases Budget Reserves and Debt Payments. As described above, Proposition 55 increases state tax revenues. Higher revenues increase required debt payments and budget reserve deposits. The exact amount that the state would have to use for paying down state debts and building budget reserves depends largely on capital gains revenues, which are difficult to predict. In bad stock market years, Proposition 55 could increase debt payments and budget reserves by $60 million. In good stock market years, Proposition 55 could increase debt payments and reserve deposits by $1.5 billion or more. Income tax increases on high-income taxpayers, which are scheduled to end after 2018, would instead be extended through 2030. Income tax increases on high-income taxpayers would expire as scheduled at the end of 2018. Proposition 55 prevents billions in budget cuts without raising taxes by ensuring the wealthiest Californians continue to pay their share. 55 requires strict accountability and transparency to ensure funds get to the classroom. We can’t afford to go back to the days of devastating cuts and teacher layoffs. Fact 1: Proposition 55 does not raise anyone’s taxes. Does not raise taxes on anyone. Proposition 55 maintains the current income tax rate on couples earning over $500,000 a year. Only affects the wealthiest Californians who can most afford it, ensuring they continue to pay their share of taxes. Lower sales tax. Under Proposition 55 all Californians’ sales tax are reduced. Fact 2: Proposition 55 has strict transparency and accountability requirements to ensure education funds get to the classroom. Money goes to local schools and the Legislature can’t touch it. Strict accountability requirements ensure funds designated for education go to classrooms, not to bureaucracy or administrative costs. Authorizes criminal prosecution for any misuse of money. Mandatory audits and strict transparency requirements. Local school districts must post annual accounting online to guarantee that Californians know exactly how and where funds are spent. Provides local control over school funding. Proposition 55 gives control to local school boards to determine student needs. Fact 3: Proposition 55 prevents up to $4 billion in cuts to schools and continues to restore funding cut during the recession. Proposition 55 helps address California’s looming teacher shortage. The state needs an estimated 22,000 additional teachers next year alone. Proposition 55 gives local school districts the money they need to hire teachers and prevent overcrowded classes. Proposition 55 helps restore arts and music. Arts and music programs faced deep cuts during the recession. Proposition 55 will help protect and restore those programs. Makes college more affordable. Proposition 55 prevents cuts to California community colleges, preventing tuition increases and helping make classes more available to California’s 2.1 million community college students. Expands health care access for children. Healthier children are healthier students. Too many families can’t afford basic health care, meaning children miss school or come to class sick. Proposition 55 helps kids come to school healthy and ready to learn, because all children deserve access to quality health care, not just the wealthiest Californians. California needs to keep moving forward, we can’t afford to go back to the days of devastating cuts to public schools, colleges, and health care. 30,000 teachers were laid off, class sizes grew, and the cost of community colleges doubled. Governor Jerry Brown has said that we’ll face even more cuts if Proposition 55 doesn’t pass. Proposition 55 gives Californians a clear choice: voting YES protects our schools and children from massive cuts; voting NO costs our schools up to $4 billion a year. California’s schools are starting to come back. Passing Proposition 55 will ensure that our children won’t face another round of cuts. The future of California depends on the future of our children. In 2012, voters approved Proposition 30 tax increases because we were promised they’d be temporary and end in 2017. Now special interests want to break that promise and extend these tax hikes 12 more years. Prop. 30: TEMPORARY taxes to fund education, guaranteed local public safety funding. Initiative Constitutional Amendment. Governor Brown promised the higher taxes would only last a few years and then end. Now, special interests want to extend them 12 more years—that’s not “temporary.” California’s economy has recovered and we now have a BUDGET SURPLUS. California has a balanced budget, we’ve reduced debt, increased school spending, put billions into California’s “rainy day fund” and still have a $2.7 billion budget surplus. California takes in more tax dollars than we need each year—that’s why the state budget recovered from a $16 billion deficit in 2012 to a $2.7 billion surplus in 2016. Education spending has soared by $24.6 billion since 2012—a 52% increase. Medi-Cal spending has increased by $2.9 billion—a 13% increase. Governor Brown has stated and budget estimates from the Legislative Analyst show that higher taxes are not needed to balance the budget. We have adequate funds for schools and other critical requirements—we just need politicians with the backbone to cut waste and prioritize our spending. What we don’t need is the largest tax hike in California history, sending billions more to Sacramento with no accountability to voters. This measure targets small businesses who often pay taxes on their business income through their personal tax return. Prop. 55 will kill jobs, close businesses and damage the economy. It’s a fair bet that Prop. 55 money will be spent to pay pension benefits and other state debt rather than making it to the classroom or building roads. It’ll be just like the lottery—we’ll never know where the money went. The politicians and special interests know California is NOT facing cuts to any programs now. They just want to grow government by passing Prop. 55—the largest state tax increase ever. Check it yourself: California has a $2.7 billion surplus, and over $9.4 billion in budget reserves. New and higher taxes aren’t needed. TEMPORARY SHOULD MEAN TEMPORARY Voters supported higher income and sales taxes in 2012 because Governor Jerry Brown made the commitment that they would be temporary. The state budget has a surplus, and these temporary taxes should go away, just like the Governor promised. PROP. 55 WILL HURT SMALL BUSINESS AND KILL JOBS. Prop. 55 will kill jobs, close businesses, and hurt the economy. It will raise taxes on California’s small businesses, and make it even harder for them to create good-paying jobs. The politicians and special interests know California is NOT facing cuts to programs. They just want to grow government bigger by passing Prop. 55. And they are using our kids and schools to scare voters into supporting it. Don’t be fooled. Education spending has grown by $24.6 billion since 2012—a 52% increase. Schools are funded, and the state budget is balanced. We have a $2.7 billion surplus and over $9.4 billion in budget reserves. Prop. 55’s new and higher taxes aren’t needed. DON’T BE FOOLED BY SCARE TACTICS, PROP. 55 IS NOT NEEDED. Official budget estimates by the state’s non-partisan Legislative Analyst show that higher taxes are NOT needed to balance the budget and fully fund schools. California can fund education, health care and state government without new or higher taxes. Vote YES on 55. Help our children thrive. Prop. 55 makes sure we won’t go back to massive cuts in school funding. It protects the education and health of our children. Prop. 55 maintains current tax rates on the wealthiest Californians to ensure couples earning more than $500,000 a year continue paying their share. Proposition 55 does not raise taxes on small businesses. Under Proposition 55 the state sales tax is reduced as planned at the end of 2016. Proposition 55 helps address the teacher shortage and continues to restore the school funding that was cut during the recession. California’s high school graduation rate rose for the sixth year in a row. Prop. 55 will help continue the progress. Revenue is guaranteed in the Constitution to go into a special account for schools and children’s health care that the Legislature can’t touch. Money will be audited every year. Audit findings are posted at http://trackprop30.ca.gov/ so taxpayers can see how their money is spent. There are strict requirements that funding must go to the classroom, not administration or Sacramento bureaucracy. Proposition 55 authorizes criminal prosecution for misuse of money. The continuation of the current tax rates on the wealthiest is subject to the vote and will of the people. Who supports or opposes this measure? See more organizations against here. See more officials against here. Bar graph showing total amount relative to total amount for this entire campaign. Below are the top 10 contributors that gave money to committees supporting or opposing the ballot measures. Sacramento State College’s Project for an Informed Electorate provides non-partisan videos on California’s ballot Propositions. Each video includes an appearance by a representative from the California Legislative Analyst’s Office (LAO). The LAO writes the state’s impartial analysis on each Proposition. Ballot.fyi is a concise nonpartisan tool that provides informational overviews of California's state-level ballot measures.